Welcome back to our ongoing episode reviews of Sailor Moon Crystal! Episode 8 picks right up where we left things last time: Zoisite badly beaten and the mysterious arrival of Sailor V. While Minako is the tough girl we all hoped she’d be, the series is continuing it’s decline in terms of story and pacing. Nonetheless, if you’ve come this far, you’re in it for the haul – be sure to check out the episode on Crunchyroll if you haven’t already! We open with Sailor Moon asking if her savior is, in fact, Sailor V. The other senshi also chime in with questions, and even Beryl expresses surprise that a fifth senshi has appeared. (Which is silly considering that Sailor V had always been a known quantity.) V-chan’s feline friend, Artemis, scolds the group for being so disrespectful to Princess Serenity – heiress to the Moon Kingdom and Legendary Silver Crystal. The revelation causes Sailor Moon’s tiara to transform, alongside a flash of the Moon Kingdom. She still can’t remember specifics, though, so no biggie. Sailor V climbs down from the roof to officially meet her comrades. The animation is particularly awkward here (though par for the course, really), with V-chan’s expressionless, doll-like eyes and tiny moving mouth. She explains that both herself and Artemis have been training the other girls using the Sailor V arcade game. Luna calls to make sure everything is alright and Sailor V suggests they return to the command center. She depowers and introduces herself as Minako Aino, second year middle school student – just like the others! Back at headquarters, Ami astutely questions why the princess hid herself from the other senshi when she knew they were searching for her. Minako then explains that she met Artemis a long time ago and the two started investigating mysterious phenomenon in Tokyo. As the duo gathered information, they discovered that the Dark Kingdom was behind the majority of the incidents. The Dark Kingdom is ruled by a being of pure evil, who destroyed the Moon Kingdom, and now wants to use the Legendary Silver Crystal to take over the world. Being the seasoned soldier she is, Minako informs the others that their mission is to seal away the evil, ensuring the past does not repeat itself – and the girls vow to fight alongside her. The meeting disbands and Minako seems to have trouble getting used to the who teamwork paradigm. She notes that there isn’t much time before the team’s memories return, and she has a very important (and mysterious) mission to complete before that happens. Let me just note that we’re halfway through the episode at this point, and we have no major plot developments. Minako hasn’t told us much we didn’t already know. And the replays continue after the break, with Usagi waking from a graphic dream about the French revolution wherein a caped crusader drags her down a burning street, fighting off peasants as they go. This dream is less compelling than the others, largely because nothing in the dream really warrants Serenity’s desperate cries. 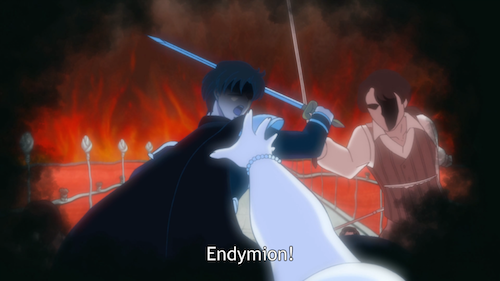 Endymion has already fought off two peasants, and there’s no reason he wouldn’t defeat the third. She’s only unnecessarily distracting him from the fight. Usagi heads off to school, with the anime omitting the adorable civilian scene with Usagi and her dad. In the manga, Usagi tells Kenji that her true identity is Sailor Moon. Usagi’s father obviously finds this laughable, and Usagi gets offended but wonders which identity is the real her: Usagi or Sailor Moon. While the scene is minor, I think it’s the omission of these small moments that is keeping me from being totally in love with the reboot. Part of the magic of Sailor Moon is that she’s both a normal girl and a soldier, trying to find a balance between the two. So far in the anime we’ve focused more on the solider and romance aspect, at the expense of getting to know the carefree klutz, Usagi Tsukino. Though speaking of romance: Usagi finds Mamoru sitting on a park bench pouring through books on crystals. He’s still bent out of shape at not being able to protect her, but as destiny has brought them together again he quickly recovers. Usagi then tries to return the pocket watch she absconded with at their last meeting, which he tells her to keep as he’s committed a small act of larceny himself. They agree to exchange items when they next meet. Meanwhile, Beryl informs Metalia of Princess Serenity’s appearance. Enraged by the idea of being sealed away once again, Metalia orders Beryl to find the Legendary Silver Crystal and bring it to her. 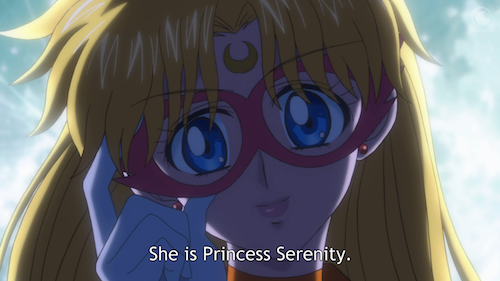 And, in the Dark Kingdom’s equivalent of the corporate ladder, Kunzite agrees to do the dirty work and go after Sailor V. He sends a telepathic message to Sailor V: “Bring the Legendary Silver Crystal to Tokyo Tower, or I’ll kill everyone in Tokyo.” This does beg the question: how does he make sure the message ONLY gets to her? 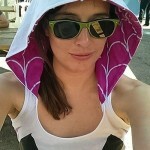 After all, if he already knows her secret identity, why not attack a bit more stealthily? Why do bad guys always need pomp and circumstance? One could argue the heroine is equally clueless, as Minako heads off to face Kunzite alone; despite having run into the other girls. Bored while awaiting Sailor V’s arrival, Kunzite cuts off all electricity in Tokyo and drains people’s energy. (Seriously, how is this city not in a panic? Something terrible has been happening to its citizens almost every week! Do they just not remember the brainwashing and passing out in the middle of the street?) An anxious Usagi’s thouhgts immediately goes to Mamo-chan, who’s awakened from his pre-dinner snooze/mysterious Princess Serenity dream session and heads for Tokyo Tower. Since I guess we’re not supposed to know that Sailor V is actually Sailor Venus, and not the moon princess – Minako transforms without a henshin phrase. The result is a little weird, and while I’m sure they wanted to show off their amazing CG effects as son as possible, I feel that the sequence could have waited until later in the series. Nevertheless, transformed and ready for action, Sailor V faces off with Kunzite. He’s protected by a barrier and V-chan’s attacks have no effect, so she attempts the emotional approach and begs him to stop – alluding that he isn’t currently his true self. Appearing to protect the princess, Sailors Moon, Mars, Mercury, and Jupiter join the fight by floating bubble. Sailor V urges them to leave, insisting that the fight is too dangerous. The girls tell Minako that she no longer has to fight alone, and should join their shiny bubble of friendship. 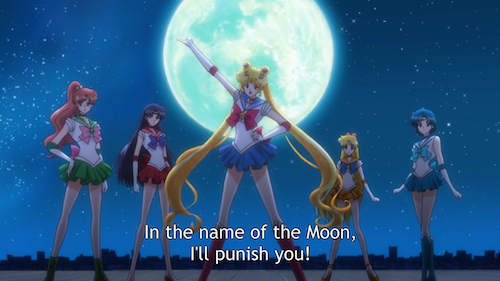 As a united team, Mercury, Mars, Jupiter, and V launch futile attacks to distract Kunzite as Sailor Moon sneaks up from behind to unleash Moon Healing Escalation. While good intentioned, the senshi’s offensive is completely ineffective. Kunzite fights back, and knocks Sailor Moon down. Not to worry though, as Tuxedo Mask is conveniently there to save her. Sailor Moon, relieved that Tuxedo Mask’s energy wasn’t drained, throws her arms around him. Then, perhaps recalling his ineffectiveness in the last battle, she pulls away and tells him to leave the battle to her and run away. In what should have been the most squeal-inducing point in the episode, Sailor Moon smooches Tuxedo Mask and returns to the fight. It’s great to see Usagi take charge here, but the kiss? Meh. Kunzite is readying a new attack as Sailor Moon jumps to guard the princess. However, the climax here is much less impressive here than in the manga. For one, there’s nothing to differentiate this attack as more powerful than the others. And for two, Usagi isn’t shoving Sailor V out of the way to protect her; she just happens to jump up at the wrong time. Nevertheless, Tuxedo Mask is determined to protect Sailor Moon this time, and the episode ends with him jumping in front of the attack to block it. But again, with nothing to differentiate this attack from the ones Kunzite hit Sailor V and Sailor Moon with earlier, Tuxedo Mask should be just fine. Memories return in the next episode, and let’s hope it’s a bit more substantial than this one was. Check out the preview below!